As events develop themselves they begin to give us an insight into the plan which Garibaldi had prepared for the liberation of Southern Italy, and the more we see of it the more we admire the vastness of its proportions. Such a plan could not have been conceived, or its execution attempted in any country but Italy, where the National party is so perfectly organized, and so completely under the control of the one man who has drawn his sword with brilliant success for the cause of Italian unity and independence. The plan was not confined to the liberation of the Kingdom of Naples only; the Papal States were to be attacked simultaneously, so as to find occupation for Lamoricière's army and the French at Rome, as well as for Bombalino's[a] troops. About the 15th of August, 6,000 volunteers transferred gradually from Genoa to the Gulf of Oranges (Golfo degli Aranci), on the north-east coast of the Island of Sardinia, were to cross over to the Papal coast, while at the same time the insurrection in the various Provinces of the Neapolitan Continent was to break out, and Garibaldi was to cross the Straits of Messina into Calabria. Some reported expressions of Garibaldi's as to the cowardice of the Neapolitans, and the intelligence received by the last steamer that he had entered Naples, and been triumphantly received there, render it probable that an insurrection in the streets of that city, which the flight of the King rendered unnecessary, was a part of the plan. The landing in the Papal States, as is already known, was prevented partly by Victor Emmanuel's representations, partly and principally by Garibaldi's convincing himself that these men were not in a fit state to undertake an independent campaign. He accordingly took them to Sicily, left part at Palermo, sent the remainder round the island in two steamers to Taormina, where we shall find them again presently. In the mean time the Neapolitan movements in the provincial towns took place as agreed upon, and in a manner which showed both how well the revolutionary party was organized, and how much the country was ripe for an outbreak. On the 17th of August, the insurrection broke out at Foggia, in Apulia. The dragoons, forcing the garrison of the town, joined the people. General Flores, commanding the district, sent two companies of the 13th Regiment who, on arrival, did likewise. Then did Gen. Flores come himself, accompanied by his staff; but he could do nothing and had to leave again. This proceeding clearly shows that Flores himself did not wish to offer serious resistance to the revolutionary party. Had he been in earnest he would have sent two battalions instead of two companies, and when he came himself, would have come at the head of as strong a force as he could muster, instead of coming with a few adjutants and orderlies. In fact, the circumstance alone that the insurgents allowed him to leave the town again is sufficient to show that there was at least some tacit understanding. Another movement broke out in the Province of Basilicata. Here the insurgents collected their forces at Carletto Perticara, a village on the River Lagni (this must be the place called Corleto by the telegrams). From this mountainous and remote district they marched to Potenza, the chief town of the Province, where they arrived, 6,000 strong, on the 17th. The only resistance they found, was offered by about 400 gendarmes, who, after a short engagement, were dispersed, and afterward came in one by one to surrender. A provincial government was formed in the name of Garibaldi, and a prodictator installed[b]. It is reported that the Royal Intendant (governor of the Province) accepts this office—another sign how hopeless the cause of the Bourbons is considered to be even by their own organs. Four companies of the Sixth Regiment of the line were sent from Salerno to put down this insurrection, but when they came to Auletta, about 23 miles from Potenza, they refused to march further, and cried Viva Garibaldi. These are the only movements of which any details have reached us. But we are further informed that other places have joined the insurrection; for instance, Avellino, a town not 30 miles from Naples; Campobasso, in the Province of Molise (on the Adriatic), and Celenza in Apulia, for this must be the place called Cilenta in the telegrams; it is situated about half-way between Campobasso and Foggia; and now Naples itself is added to the number. While thus the Neapolitan provincial towns at least carried out their apportioned share of the work, Garibaldi was not idle. Scarcely returned from his trip to Sardinia, he made his final arrangements for crossing over to the continent. His army now consisted of three divisions, commanded by Türr, Cosenz, and Medici. The two latter, concentrated about Messina and the Faro[c], were marched toward the northern coast of Sicily, between Milazzo and Faro, as if they were intended to embark there and land on the Calabrian coast, north of the Straits, somewhere about Palmi or Nicotera. Of Türr's division, the brigade Éber was encamped near Messina, the brigade Bixio had been sent to the interior, to Bronte, to repress some disorders. Both were at once ordered to Taormina, where, on the evening of the 18th of August, the brigade Bixio, along with the men brought from Sardinia, embarked on the two steamers, the Torino and Franklin, and some on transports taken in tow. About ten days previous Major Missori, with 300 men, had crossed the Straits and safely passed through the Neapolitans to the high and broken ground of Aspromonte. Here he was joined by other small bodies, thrown across the Straits from time to time, and by Calabrian insurgents, so that by this time he commanded a body of about 2,000 men. The Neapolitans had sent about 1,800 men after his little band when landed, but these 1,800 heroes managed so as never to come up with the Garibaldians. On the 19th, at daybreak, Garibaldi's expedition (for he was on board himself) landed between Melito and Cape Spartivento, on the extreme southern end of Calabria. They found no resistance. 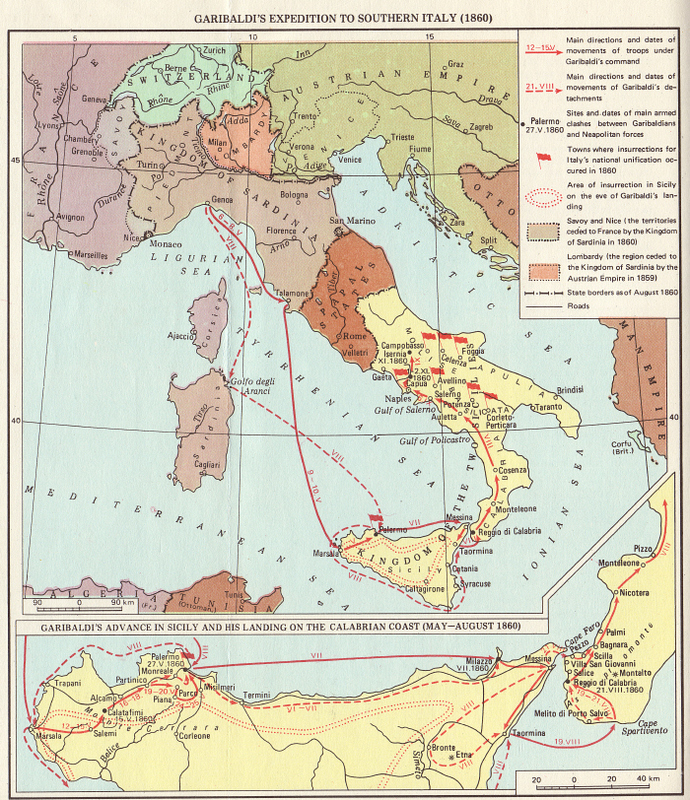 The Neapolitans had been so completely deceived by the movements threatening a landing north of the Straits, that the country south of them was completely neglected by them. Thus 9,000 men were thrown across, beside the 2,000 got together by Missori. Having been joined by these, Garibaldi at once marched on Reggio[d], which was occupied by four companies of the line and four of chasseurs. This garrison must, however, have received some reenforcements, as some very severe fighting is reported to have taken place in or before Reggio on the 21st[e]. After the storming of some outworks of Garibaldi, the artillery in the fort of Reggio refused to fire any longer, and Gen. Viale capitulated[f]. In this engagement Col. Deflotte (the Republican member for Paris in the French Legislative Assembly of 1851) was killed. Thus in three days Garibaldi had made himself master of the whole coast of the Straits, including some of the fortified points; the few forts still occupied by Neapolitans were now useless to them. The two following days appear to have been occupied by the passage of the remainder of the troops and of the materiel—at least we do not hear of any further engagements until the 24th, when a severe contest is reported to have taken place at a place called in the telegrams Piale, which we do not find on the maps. It may be the name of some mountain torrent, the ravine formed by which might have served as a defensive position to the Neapolitans. This engagement is said to have been undecided. After some time the Garibaldians offered an armistice, which the Neapolitan commander referred to his General-in-Chief at Monteleone. But before an answer could arrive, the Neapolitan soldiers appear to have come to the conclusion that they had done quite enough for their King, and dispersed, leaving the batteries unoccupied. The main body of the Neapolitans, under Bosco, appears during all this time to have quietly remained at Monteleone, some thirty miles from the Straits. They do not seem to have been very eager to fight the invaders, so Gen. Bosco went over to Naples to fetch six battalions of Chasseurs, which are, next to the Guards and foreign troops, the most reliable portions of the army. Whether these six battalions were themselves infected by the spirit of dejection and demoralization reigning in the Neapolitan army remains to be seen. Certain it is, that neither they nor any other troops have been able to prevent Garibaldi from marching victoriously, and probably unchecked, to Naples, to find that the Royal family had fled, and the gates of the city open to his triumphant entrance. [b] See "Affaires d'Italie", Le Constitutionnel, No. 241, August 28, 1860.—Ed. [e] Le Constitutionnel, No. 240, August 27, 1860.—Ed. [f] Le Constitutionnel, No. 241, August 28, 1860.—Ed. After the defeat of the Roman Republic in 1849 the French interventionist troops did not leave Rome until 1870.